Pay for them. Don’t run out of the store clutching these things like a lunatic. Although if you’ve already eaten one of these bad boys, you will be forgiven for acting this way. Still, be cool. Be cool. Go home. Put the package of regular Oreos in a bag. Pulverize them with a rolling pin until they’re nothing but fine, mealy crumbs. Then, in a kitchen stand mixer or a regular old bowl, combine the crumbs with a package of cream cheese until it’s all well-blended. Scoop out the mixture and roll them into little balls- about 2 TBsp per ball should suffice. Set the balls on a baking sheet, lined with aluminum foil and sprayed with a little vegetable oil to keep them from sticking. Then impale the little suckers with lollipop sticks, about 3/4 of the way in, molding the cookie mixture more firmly around the stick. Repeat process with the vanilla cookies. Then refrigerate the lot for a few hours, maybe overnight. The next day, or after your little happiness nuggets are well-chilled, toss the baking chocolate squares into a bowl and microwave until melted, according to the package instructions. Dip the babies into the chocolate until well-covered. Then pop them into the styrofoam. They’ll stay upright and won’t have those weird flat heads and the other cake pop mothers won’t glare at you with judging eyes. Chill again until the chocolate hardens into a thin candy shell. And then eat them. Eat all the pops. When you take a bite, there will be a crunch and then the chocolate will give way and melt slightly in your mouth and on your hands and everywhere. Then, the Oreo-Cheesecake like center will envelope you in a warm embrace. Shhhhh, it’ll say. Shhhhh. Don’t speak. Let this happen. We did regular Oreos dipped in the semi-sweet chocolate and the vanilla Oreos in white chocolate. And now I’m fantasizing about annihilating cookies of all kinds. Peanut butter with strawberry cream cheese! Maple cremes with a syrup drizzle! Lemon shortbread with a glaze! Oh, the places we will go. They’re so good, I want one right now! I think my favorite part of your blog are your Mom’s adorable comments. I love your blog. I am a dreadful coock but I CAN make your recipes so well! I enjoy the stories a lot. Congratulation!!! are you KIDDING ME with these things? These are fab!! My daughter always begs me to buy her these at Starbucks. It will be fun to make them with her! The starbucks ones are so gross, why would you want to make one on your own? Just because Starbucks is gross doesn’t mean homemade ones are. Starbucks was never meant to be a bakery. They pull all those concoctions out of plastic trays, I’ve watched them. Cake pops are awesome! Perfect little bite of sweet fudginess on a portion controlled stick. 🙂 And these look divine! These look absolutely amazing and easy to make! I really want to try them! Do you mean Golden Oreos?? They’re really quite good! You are hilarious – it’s like Tina Fey has a food blog. I love. i made these yesterday and the oreo’s were a hit! the vanilla not so much but these were fun to make.. 🙂 quite a workout too crushing them into pieces… ;D thank you! I’m a reader from Dubai, How many Oreo’s are there in a package. Im sure the packaging must be different here. (this must be the most absurd question you would hve answered :-)). thank you. how big a package of oreos did you use? OK, I counted at the store- a package has 16 servings of 2 cookies- so 32 cookies total. I make these as “truffles”. NEVER thought to make them into pops!!! Next time, for sure! They were too sweet!! I think I’ll use something else other than Oreos..
Peach Pie Nuggets | Some Kitchen Stories Peach Pie Nuggets | 1 Photographer. 1 Writer. This is Our Food Blog. The balls are sliding down the lollipop stick, after I dip them in the melted chocolate. What am I doing wrong? We had the same problem at first! Make sure they are really well-chilled, that the stick is firmly in place (don’t wiggle it around too much) and, when in doubt, make it a little smaller. 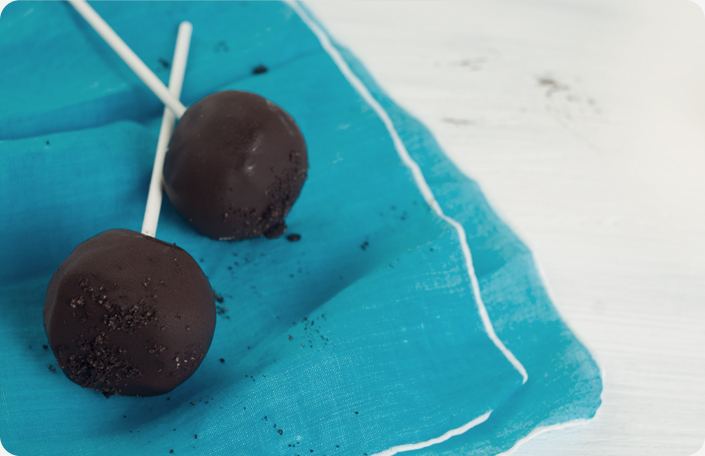 If you’re still having trouble, chill the pops and then just drizzle the chocolate over them. No one will care, they’ll be just as delicious. 🙂 Hope that helps! If you dip the sticks in melted chocolate before you stab the cake balls, it will act as glue and keep the balls on the stick. They also must be well chilled but if they are too chilled and the chocolate is too warm, your coating will crack. Good luck! How many will the recipe make? I’m super excited to make these for my son’s bd party saturday! I’d say each batch of cookies (we made 2) yielded about 12 pops. We filled two baking sheets. You might get more if you make your pops a little smaller too. Also don’t be discouraged if they slide down the stick- make sure they’re chilled enough! I like to put them in the back of the fridge where it’s coolest. I made these for my birthday, dark oreos with white chocolate frosting and they were a hit! Over here in Europe Cake Pops are only known by those who patronate Starbucks, and they all went, “You made these? Honestly, how much were they at Starbucks?” Nobody believed that they were pretty easy to make. In the course of a few minutes all twelve I made were gone, so thank you very much for this recipe, I’m sure to try this with white oreos, too! oreo truffles are amazing!! and super easy to make! These sound heavenly!! 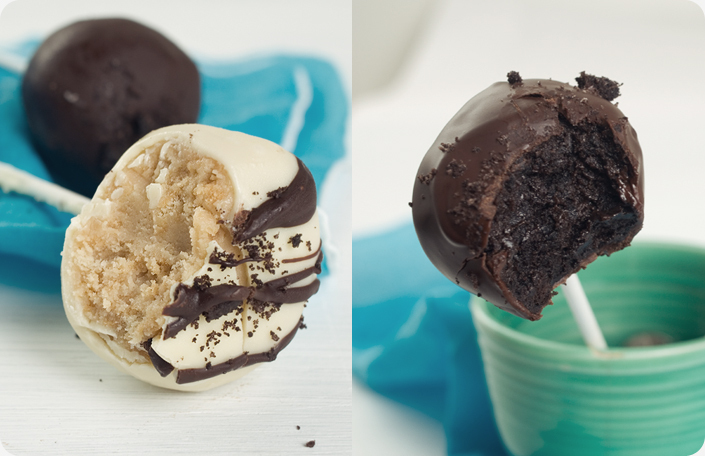 I make cake pops quite often and I have some tips on the sliding issue: before you insert the sticks, dip the sticks in the melted chocolate and then then into the pops. Then stick the whole tray back in the fridge for another half an hour. Also, just take out about 5 at a time to fully coat in the candy so they don’t heat up too much. I’m so excited to try this!! What about nutter butters with nutella frosting? So many options!! I made these last night. Had major issues with them sliding down the stick, even though they were well chilled. I ended up dipping the sticks in the chocolate as suggested before, and then in the pops, and letting them chill. Then I dipped the whole pop in the chocolate and I put them in an ice water bath to set the chocolate. I held them in the ice water for 10 seconds or so. It was enough to set the chocolate and stopped the slipping. Once I did that it went quickly and very smooth! nice! I like the doughnut holes dipped in chocolate, good idea! Clementine Cake Recipe Some Kitchen Stories Clementine Cake Recipe | 1 Photographer. 1 Writer. This is Our Food Blog. you should write a book or something you are hilarious. I just wanted to get the gist of what I needed to do because I’m in a hurry but I couldn’t stop reading everything. Thank you for the post! I’m in tears from laughing so hard this morning! thank you for your funny recipe! Try regular oreos 1/2 with mint oreo 1/2 it’s AMAZING! Or nutter butters, with vanilla wafers. AAAAAAAAAAAAAAAAAAAAAA … heavenly elation !!!! 1. do you taste it? 2. is it just for binder? 3. is there something i can substitute for it? Hey Kenly, you don’t really taste the cream cheese, it’s more of a binder. When it’s mixed with the oreos it’s really sweet so it doesn’t taste like cream cheese, it’s delicious! Hello, I was wondering exactly how many pops one package of oreos make? 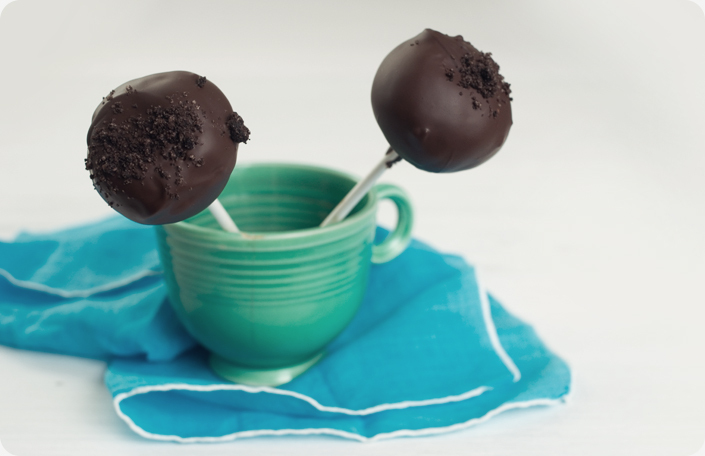 Hello, just read this and so happy to find a no bake cake pop. Also laughed at your account of eating them! We are making these today as a ‘practice run’ for my daughter’s birthday. How long can they stay un-refrigerated after they are made? We want to bring some into her class on her birthday but don’t want them melting on the way. Thank you! They can stay un-refrigerated for a while without melting. I would keep them in a cool place though, and lay them flat so the weight of the cake doesn’t make it slide off the stick. If you make the pops a little smaller you might have an easier time keeping them all on the sticks while transporting, hope that helps! These are a great idea on the stick. I am going to make them for our Super Bowl party. I’ve made these on the stick and off. Without sticks, I put them in mini cupcake papers. I made these last night for my daughters birthday and theyre beyond delicious. i put white chocolate on the brown oreos tho and it was amazing. Yes, theyre super sweet, but just eat it slowly or eat a half or something, but you gotta eat one… just sayin.